Newcomer Josh West steered out Merlyn MK20a to a superb victory at Brands Hatch on September 23rd. in his first ever motor race ! The ex Tim Brise machine, which has scored numerous victories in recent seasons with Callum MacLeod at the wheel, was hastily repaired following a testing crash on Friday which damaged the rear of the car. "We knew from testing that Josh would be competitive, but when Sunday dawned wet and knowing that Josh had never driven in these conditions before, I had my expectations well under control ! However a combination of Josh's skill, a good wet weather set up on the car and expert tuition from our driver coach Callum MacLeod combined to provide the perfect result." Josh races next at Silverstone on October 20th. 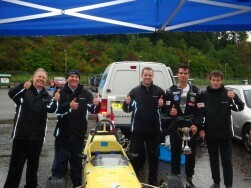 in the final round of the Historic Formula Ford Championship when we are hoping for more of the same ! Meanwhile our MGB will be racing at Malory Park on October 7th. and then Donington on October 11th. with owner Oliver Eaton and Callum MacLeod at the wheel.